Sister Flannan McGuane managed the bakery and kitchen from 1960 to 2003. 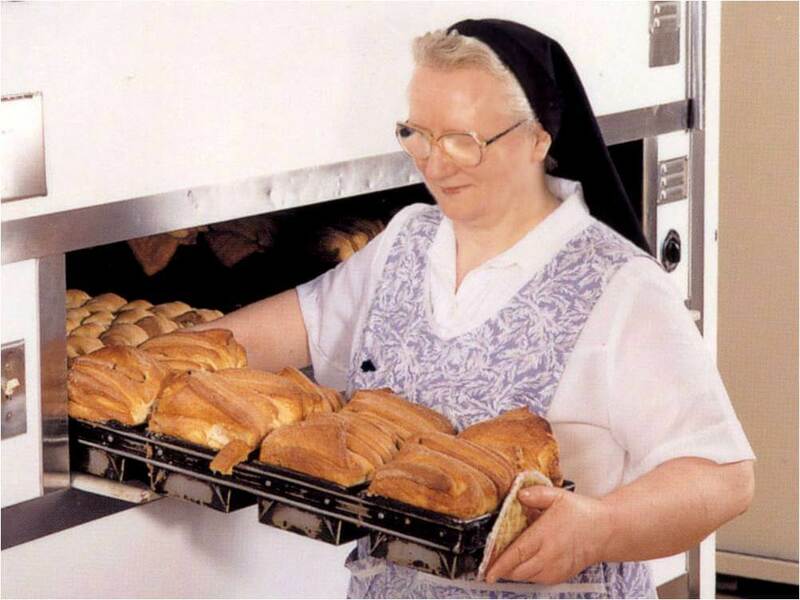 Sinsinawa Bakery, located at the Sinsinawa Dominican Motherhouse in southwest Wisconsin, has had an aroma filling its walls long before the public became familiar with our products. “Mound Bread” became famous for its homemade flavor among a growing crowd of admirers in the 1960s and ’70s. People who visited Sinsinawa Mound experienced the wonderful, homemade baked goods and wanted more. Although the Sisters never intended to sell it, the bread was so delicious that word spread and demand continued to grow as the product advertised itself. Today, close to 100,000 baked goods are sold to friends and guests every year. Your purchase helps support the Sinsinawa Dominican Sisters as they continue their mission of preaching and teaching the Gospel. Stop by Sinsinawa Mound and visit our Sinsinawa Book & Gift Gallery where you can purchase our fresh baked products and more. The Sinsinawa Book & Gift Gallery is open from 10 a.m. to 5 p.m. Monday through Saturday (closed on Mondays during the months of January, February, and March). Call (608) 748-4411, ext. 849 to reach the Sinsinawa Book & Gift Gallery or email gallery@sinsinawa.org. Purchase our products at the Book & Gift Gallery. Can’t make it to sinsinawa? No Problem! Our bakery products can also be found throughout the tri-state area at these locations.